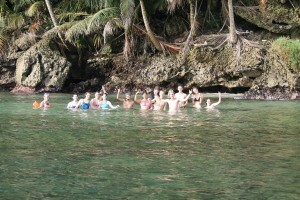 We recently got back from a field trip to the Caribbean side of Costa Rica and Panama. Boots take a long time to dry, especially when they are Gortex. Buttering the outside of a grilled cheese sandwich makes it more delicious. First stop: Eladios.—We started our field trip by hiking about 15 km to a place called Eladios that is located in the middle of the Peñas Blanca valley. We stayed here for four nights and thinking about to all the places we went on the field trip, this was probably one of my favorite. Eladios is a house basically in the middle of nowhere that is a place for student groups to come to stay. The former owner of the place, Eladios, was there to greet us and cook us delicious food. We had no communication to the outside world because there was no electricity and as a group, we had to learn to entertain ourselves at night with night hikes or games while being illuminated by candlelight. 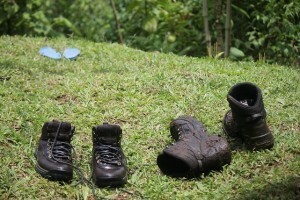 Afterwards: Poco Sol.—After Eladios, we hiked another 15 km to a biological station called Poco Sol. 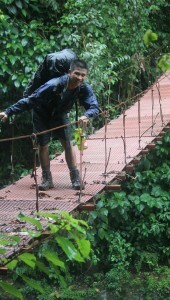 Hey, it is the wet season in Costa Rica after all and we truly got to experience it on this hike. In order to get here, we crossed many rivers and climbed many hills in a down pouring rain. The station at Poco Sol had a really big porch for us to bird watch and to learn about them and that is what we spent most of the time at Poco Sol doing. On a side note, coming to Poco Sol marked the point in our field trip where we reached what our group calls “Snackland.” Snackland is any place where there are always snacks available to satisfy our every snacking-need. 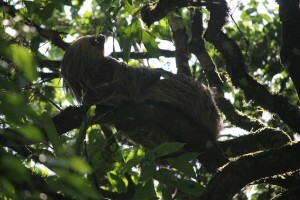 Next stop: La Selva and Tirimbina.—Two days later at Poco Sol and we’re headed off to La Selva. We only had the opportunity to spend one night at La Selva, but it was nice to be able to know about one of the largest biological reserves in the world. 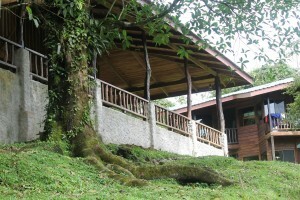 The reason why we only spent a night in La Selva is because while being very big, it also attracts a lot of tourism, researchers, and other students. 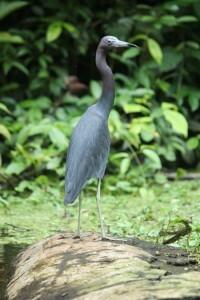 We ventured to Tirimbina instead because it had the same forests as La Selva, but we were in a more secluded area. At Tirimbina, we had one of our Humans in the Tropics day where we learned about logging and tree farming. We visited a reduce-impact logging farm and a tree plantation that looked completely different from each other. A forest engineer was there to answer our questions and we learned about the impact of logging and how it is truly unsustainable economically and ecologically in Costa Rica. Later on: Tortugero.—As the name sounds, yes, there are turtles there. We woke up early at four in the morning to go find turtles. 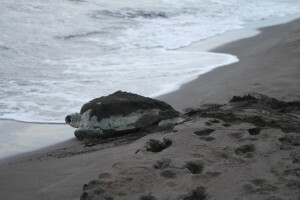 We initially saw a lot of tracks of turtles venturing onto the beach but returning back to see, but we finally found a turtle that was laying her eggs. It was a morning well spent. Last stop: Panama.—It was a long travel day and after a computer issue at the Costa Rican-Panamanian border, we finally made it to Bocas del Toro, a group of islands off the coast. The time spent in Panama was devoted to learning about marine diversity, as most of the marine diversity in Costa Rica has been destroyed by the banana plantations near the coast. To see and learn about the diversity of the ocean, we snorkeled. And we snorkeled more. Our full day of snorkeling is most evident in the sunburns that many people got. This field trip was different in that we went to different places, but as a group we all knew each other a lot better than during the first field trip. We learned more about the different ecosystems and diversity in the tropics and the importance of their conservation. While it is unfortunate that this was our last big field trip, I look forward to being in Monteverde for a month doing my independent project and being in home stays! This entry was posted in David Ho '14, Costa Rica. Bookmark the permalink.